IELTS Writing Task 1: Two Pie Charts with a Table. Different language will be used for static charts and dynamic charts. So for example, you cant use the language of trends for a static chart because the data doesn’t change over time. Always make sure that you first analyse the chart or graph to see if it is one time period, or the data is changing over time. If you use trend language for a static chart you will lose marks for grammar. 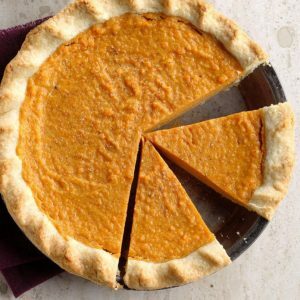 With IELTS Pie Charts you have to compare and contrast the information. Pick out the key features of the graph or chart and write about those. This pie chart is reproduced from the Cambridge 11 IELTS book which you can find on amazon. I advise using official IELTS material from either ielts.org, the British council or Cambridge IELTS books. The table below shows the numbers of visitors to Ashdown museum during the year before and the year after it was refurbished. The charts show the result of surveys asking visitors how satisfied they were with their visit, during the same two periods. The first thing I have to do here is to paraphrase the question which is the introduction. I have highlighted the words and sentences that were paraphrased below in green. The table illustrates the number of people who visited Ashdown museum in the year before and the year after refurbishment. Visitors were surveyed about their satisfaction during their visit, the pie charts indicate the result of the surveys in the same two periods. I didn’t paraphrase the word ‘table’ or ‘chart’ which can’t be changed, and I also kept the phrase ‘year before and year after..’ and ‘the result of the surveys’ Show = indicate / illustrates. However, you do not have to paraphrase everything in the introduction. Now it is time to take the key information and summarise the main features of the table and charts , Do not write any statistics here or go into too much detail. I will go into more detail in the body paragraphs. Overall, In the year after refurbishment, visitor numbers had increased considerably which indicated that they were much happier about their visit. Prior to the renovation, a larger number of people expressed dissatisfaction with their visit. Now it is time to group the data and go into more detail about statistics and trends. In body paragraph one I will write about the year before refurbishment and body two will be detail about the year after refurbishment. Grouping the data is important in this part of writing task 1. In the year before refurbishment total visitor numbers stood at 74, 000. Less than a fifth of those were very satisfied with their time at the museum. On the same note, just under a third of visitors indicated that they were satisfied. In contrast, two fifths of total visitors showed they were dissatisfied and accounted for 40% of visits. One in ten people said they had been very dissatisfied before renovations were made to the museum. A small minority did not respond to the survey before or after the renovation work. With regards to the year after refurbishment work was carried out, there was an extra 18,000 visitors, totalling 92,000. In addition, the charts show a considerable change in the number of people who claimed they were happy with their visit to the museum. The number of people who were satisfied jumped by 10%, this time they polled at more than a third. Likewise the number of very satisfied visitors increased to almost two fifths. In comparison to the year prior to refurbishment, dissatisfaction levels saw a sharp decline and dropped from two fifths to less than a fifth. Very dissatisfied visitors had halved. Note on word count: You are probably thinking this is too long, yes it is, but I have done this for example purposes to show how to paraphrase statistics and demonstrate the grammar that is needed. The model answer at the end has a reduced word count. In the body paragraphs, I have highlighted in red the past simple tense which is the main grammar needed here because the pie charts indicate two points in the past. Key point here you will notice I have used the words renovated and refurbished , these are synonyms so I didn’t want to keep repeating the same word. The table illustrates the number of people who visited Ashdown museum in the year before and the year after refurbishment. Visitors were surveyed about their satisfaction during their visit, the pie charts indicate the result of the surveys during the same two periods. Overall In the year after refurbishment at Ashdown museum, visitor numbers had ________ ________. which indicated that they were much happier about their visit, ________ ________ the renovation, ___ _________ ________ ______ people expressed dissatisfaction with their visit. In the year before refurbishment total visitor numbers stood at 74, 000. ____ ____ __ ____ of those were very satisfied with their time at the museum. On the same note, _____ _____ __ _____ of visitors indicated that they were satisfied. In contrast, two-fifths of total visitors showed they were dissatisfied and ______ ____ 40% of visits. ____ ____ _____ people said they had been very dissatisfied before renovations were made to the museum. __ _____ _______did not respond to the survey before or after the renovation work. 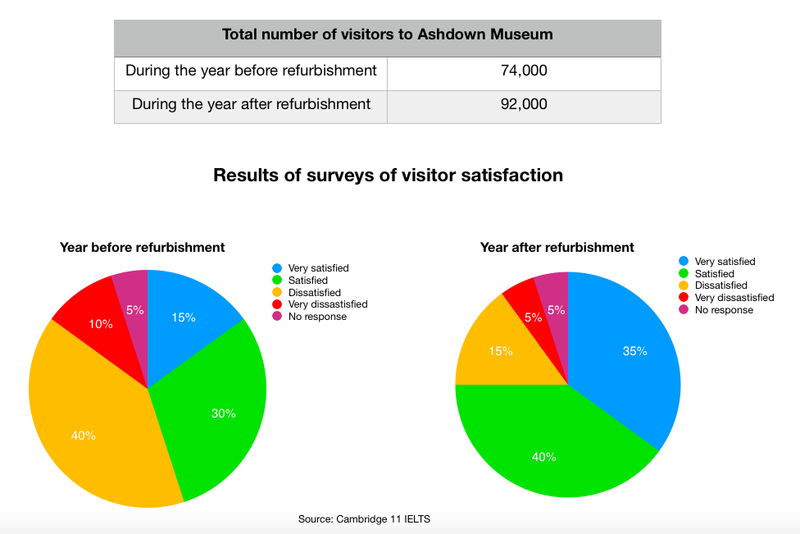 The table illustrates the number of people who visited Ashdown museum in the year before and after refurbishment. Visitors were surveyed about their satisfaction levels during their visit, the pie charts indicate the result of the surveys in the same two periods. Overall, In the year after refurbishment, visitor numbers had increased considerably which indicated they were much happier about their visit. Prior to the renovation, a larger number of people expressed dissatisfaction with their visit. In the year before refurbishment, total visitor numbers stood at 74,000. Less than a fifth of those were very satisfied with their time at the museum. On the same note, just under a third of visitors indicated that they were pleased. In contrast, two-fifths of total visitors showed they were dissatisfied and accounted for 40% of visits. A small minority did not respond to the survey. Regarding the year after, visitor numbers amounted to 92,000. In addition, the charts show a considerable change in those who claimed they were happy with their visit. Satisfaction levels jumped to more than a third. Likewise, very satisfied visitors increased to almost two fifths. Dissatisfaction levels declined from two fifths to less than a fifth. Note on word count: This response is 197 words so is quite long, I advise aiming for around 170 to 180 words for task 1 academic. The minimum word count for writing task 1 is 150 words.